If talking dogs are what you want, then a Fiesta is what you will get! 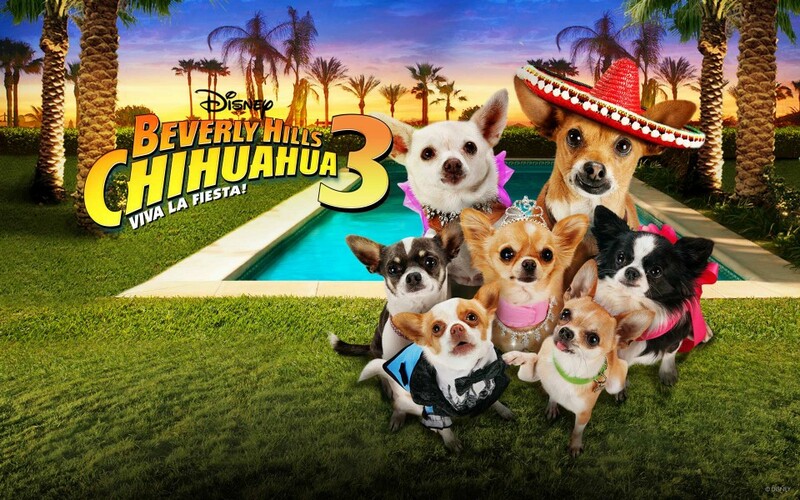 After two hits, the Chihuahuas are back for Beverly Hills Chihuahua 3: Viva La Fiesta! This third installment of the direct-to-video franchise follows beloved Chihuahua, Papi (played by George Lopez) and his family on a journey that is sure to be fun for all. The canines are lead by acclaimed director, Lev Spiro who directed such television hits as Ugly Betty, Arrested Development, Weeds, Everybody Hates Chris and Are We There Yet. In a world where being fashionably late was never in style, Disney Digital Studio Services showed up to the Fiesta early and rendered both technical and creative services that helped the project arrive in home theaters on time and on budget. DDSS recently sat down with Spiro and his producer, Sara White to talk about their experience working on the lot and the advantages of DDSS’s on-lot services. Another advantage to working with Disney Digital Studio Services is the high-speed fiber “Connections” services, which enables one to send and receive files globally through a network of multiple, 10 gigabit per second fiber optic connections with key vendors and telecommunications portals. Often unseen, Spiro and White were very aware of the advantages of “Connections”. “I was aware that editorial functioned very smoothly,” recalls Spiro. “At one point I had four different avid rooms running plus the visual effects department and I was never aware of having to wait. For me that’s kinda the wheels turning under the surface. Also, for screenings, we would send the entire film to the Digital Media Center (Bldg 95). That was pretty impressive with such big files.” This was due to the enterprise class connectivity that DDSS put at the shows disposal. Connecting to DDSS networks afforded Spiro the type of world class connectivity that enabled the production to work internationally with ease. Sound played a very important role in BHC3 and helped to create an environment that supported the story. “Sound is an enhanced character in our movie,” White says. Digital Studio Services helped to liven up that character, providing ADR and Sound Mixing Services. Once again, proximity paid off with Re-Recording Stage A and ADR Stage B only a hop skip and a jump from the Editorial and VFX Rooms. ADR – Stage B Equipped with the latest in digital playback technology and a world-class microphone collection, an even bigger draw of Stage B is Academy Award Nominated DDSS Mixer, Doc Kane. Doc recorded all of the voices of the talking dogs on all three of movies within the BHC franchise. “Doc was-amazing,” recalls Spiro. “We actually recorded ADR at four other studios and Doc was by far the best ADR mixer. He was wonderful with the talent and amazing with the whole procedure of it.” BHC3 was offered the flexibility of 2 channel recording. Doc used two different microphones: The U87 and the Schoeps which allowed for greater flexibility, with the Schoeps mic having more of a production sound. Re-Recording Stage A The premier re-recording stage on the Walt Disney Studios lot, Stage A provided an excellent acoustic environment for BHC3. “The stage (Stage A) was amazing,” recalls Spiro, “right down to the ping pong table.” Spiro worked with Sound Supervisor, Tom de Gorter, Emmy Award Winning DDSS re-recording mixer, David Fluhr and re-recording mixer Chris Minkler to perfect the mix. “In this case,” says Spiro, “I wanted the film to be grounded in reality. There is a conceit that when dogs talk to each other, they are talking with human language but when humans are around, they just hear dogs barking. But there are a lot of scenes in the film where you have both in the same scene, so it’s very tricky. So what do you hear?” de Gorter and Fluhr helped to fashion those moments so that they had a realistic component to them and felt more grounded in reality. 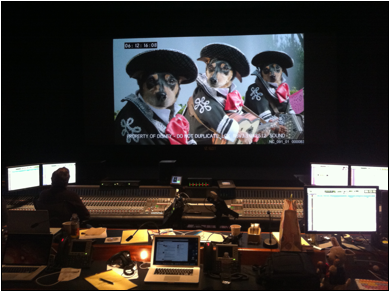 From collaborative workspaces to Digital Media Services to Sound Services, the Walt Disney Studios was a one stop shop for Beverly Hills Chihuahua 3. “For me it was wonderful working on the lot,” says Spiro, “The facilities here and the personnel are top notch. Every aspect of being on the Disney lot was simply wonderful.” Never one to arrive to a party empty handed, DDSS showed up with technical services that greatly improved efficiency and creative services that lent to the magic of “talking dogs”. A fiesta on the screen is what everyone will see, but know that the party started long before and Disney Digital Studio Services was happy to arrive early with services fit for a Chihuahua!